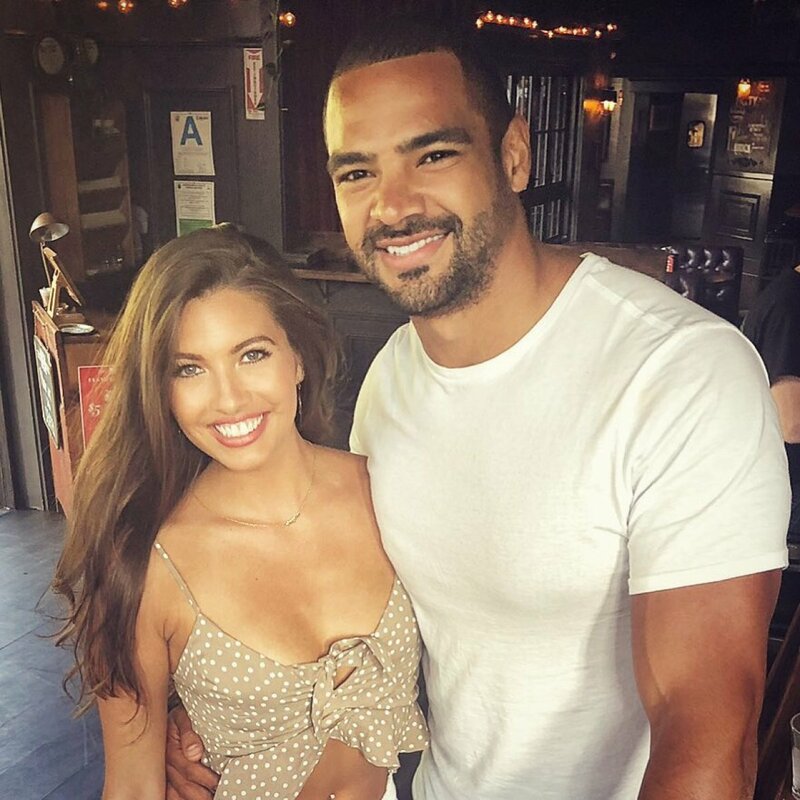 Bachelor in Paradise's Angela Amezcua apparently has a boyfriend, and it's Clay Harbor from The Bachelorette's fourteenth season. Clay Harbor, who competed for Becca Kufrin's heart earlier this year, announced on social media he is dating Angela. "What do the kids call it? Woman crush Wednesday? Well here's mine," Clay, 31, captioned an Instagram photo of the cute couple embracing on September 5. "#outkickingmycoverage #whatwashethinking #wcw." Clay, a 30-year-old professional football player from Chicago, IL, added an emoticon with heart eyes, while Angela commented two pink heart emojis on his post. Clay also gushed about his new relationship on Twitter. He shared the same picture and wrote, "If I had a rose to give she would get it EVERY time." Clay had to eliminate himself from The Bachelorette competition during a June episode after injuring his wrist during a playful football game on a group date. Clay wanted to continue fighting for Becca's heart on the show because he thought she was an amazing woman, but doctors advised him to undergo immediate surgery in order to continue and sustain his career in the NFL. Angela, a 26-year-old model from Greenville, SC, found fame when she vied for Nick Viall's attention and affection on The Bachelor's 21st season in 2017. Angela then looked for love on Bachelor in Paradise's fifth season. Angela got wrapped up in a romance with Eric Bigger and the pair agreed they were "all in" with each other; however, the bachelor wanted to pursue a romance with NBA cheerleader Cassandra Ferguson once she arrived at the resort in Mexico. Eric chose Cassandra over a devastated and blindsided Angela, who went home without a rose, but he ultimately chose to quit the show. Eric felt emotionally drained after Angela left Paradise, and he didn't feel ready to commit himself to another woman. Hours before Clay made his announcement on social media that Angela is his girlfriend, he teased that he was dating someone new and would reveal her identity soon. Bachelor Nation has been responding to the big news with a lot of love and support. Astrid Loch from Bachelor in Paradise, for example, commented under Clay's photo, "This makes my heart so happy." BIP bachelors Chris Randone chimed in, "Let's goooo 'matchmaker,'" and John Graham also said, "There it is!!!! Two models."